About year and a half back I had made a posts about a building in Potsdam, Germany which is Not A Mosque but looked like a mosque. 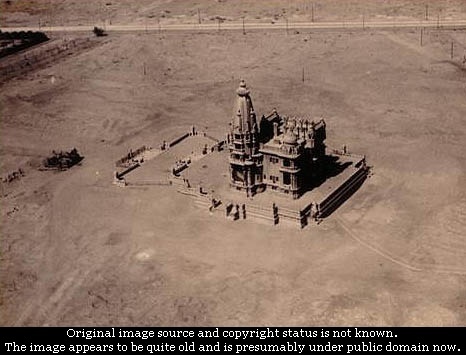 Today I present another unusual building in Egypt which is not a temple but looks like an Indian temple. 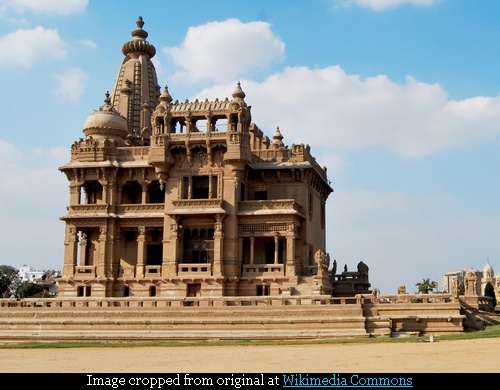 The Palace of Baron Empain (Arabic: Qasr Al Baron) aka as Palais Hindou, in Heliopolis, a suburb of Cairo, is a residential palace built by Belgian born Baron-General Edouard Louis Joseph Empain in 1911. 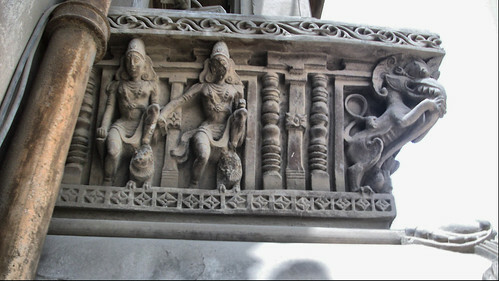 The design and decorations of the palace took inspiration from temples in India specially the temples in Orissa/South India. 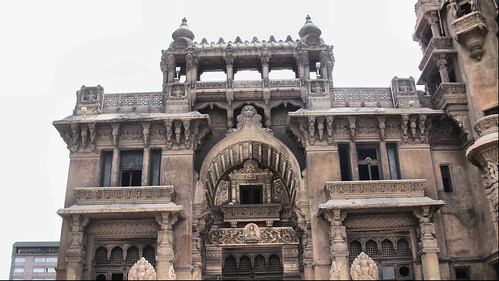 The palace was designed by French architect Alexandre Marcel and decorated by Georges-Louis Claude. 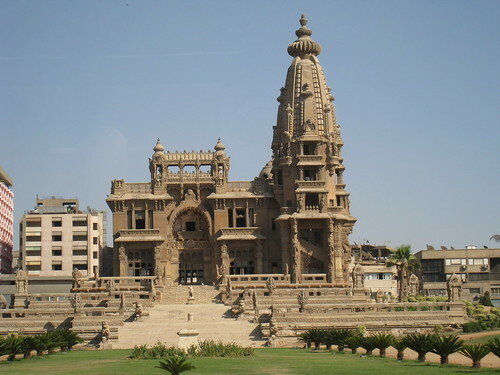 Baron Empain, a Belgium entrepreneur arrived in Egypt in 1904 and fell in love with the desert. He started the Cairo Electric Railways and also developed a new luxury town ship near Cairo by buying about 25 square kilometres of cheap desert land, northwest of Cairo. The township was designed as a city of luxury and leisure. His palace built on a raised artificially created platform, was one of the first building to be built in the area. Reportedly he wanted to watch the progress of Heliopolis city from his palace. Unfortunately after his death the palace fell into disrepair due to squabbling of his successors and subsequent owners. Many of its interior decorations were plundered by looters and walls and frescoes defaced with graffiti. It was reportedly also used by drug peddlers and by devil worshippers and ultimately it became home to bats and stray dogs. The Egyptian government has now acquired it and plan to renovate and convert this unusual building into a Museum. King Saud University Forum (in Arabic) (English Translation) - It has some rare and old images of the Palace and Heliopolis. Flickr Photostream of Youssef Abdelaal - A good collection of recent images including images of pitiable condition of its interior. 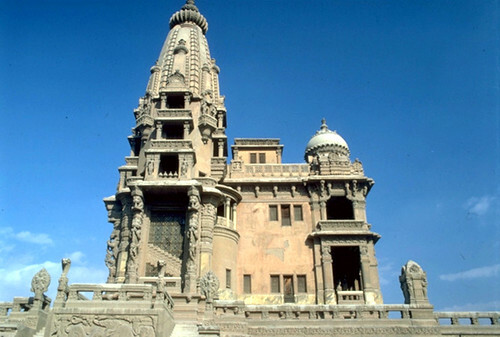 I just found your blog and enjoyed looking at this castle in Heliopolis. I have been to Heliopolis three times to visit my cousins but I have never seen this castle. I also enjoyed the clip on the road in Norway. I just returned from a trip down the Norwegian Coast and there was a road just like this I could see from the ship. I took pictures and in a future post I shall show them. Your pictures are very nice. I like to travel but when I am home I like to read about travels too. The credits for my posts mainly goes to all those photographers whose pictures I use to bring life to my posts. I also read your blog Recollections of a Vagabonde and am very impressed with it. I look forward to your post about your Norwegian trip. Absolutely love your blog. THANK YOU! BTW, here's another pic from the early days of Heliopolis and youu can see the Baron's mansion in the foreground. it will be nice addition to your collection.